Canberra: A resurgent Mitchell Starc took five wickets as Australia wrapped up a confidence-boosting 2-0 series thrashing of Sri Lanka Monday, with the tourists skittled for 149 in the second Test at Canberra. In front of a sparse crowd on day four, Sri Lanka resumed on 17 without loss, needing a daunting 516 to win and ended 366 short. 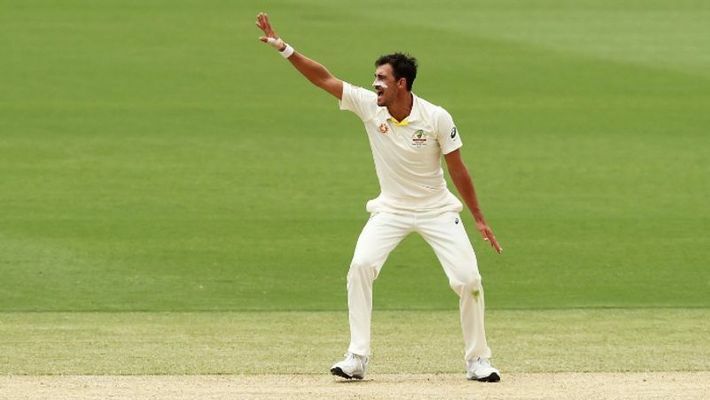 There was little resistance from the under-strength visitors who wilted under a pace onslaught led by spearhead Starc, who ended with 5/46 and took 10 wickets in the game as he emphatically bounced back from a lean spell. Tim Paine set the big run chase after declaring Australia's second innings at 196/3, following their mammoth first innings 534 for five declared. Sri Lanka were bowled out for 215 in reply. Dimuth Karunaratne and Lahiru Thirimanne had survived a tough six overs on Sunday ahead of stumps, and they resumed with hopes high of putting up a fight. Sri Lanka bowling coach Rumesh Ratnayake had made clear the team wanted to at least take the game into a fifth day to provide some momentum ahead of a Test tour to South Africa, starting in Durban later this month. But Karunaratne did not heed the message. He failed to add to his overnight eight with Starc, bowling at close to 145 kph (90 mph), clipping his leg bail in only the third over of the day. It was a big blow for Sri Lanka with the experienced opener their best batsman in the first innings before he was struck in the head by a Pat Cummins bouncer. Captain Dinesh Chandimal also failed to deliver, struggling against the speed and bounce of a fired-up Starc, bowling at perhaps his best over the past year. Niroshan Dickwella was next in, promoted to number four from his usual six and the wicketkeeper-batsman was building a handy partnership before Thirimanne was removed by Cummins for 30. Thirimanne tried to fend off a short ball from the paceman but it ricocheted off his bat and Cummins took an athletic diving catch. It went from bad to worse for Sri Lanka with Dickwella bowled by Starc for 27 just before lunch and Kusal Perera, cleared to play after taking a hit on the helmet on Sunday, out for a golden duck next ball. They went to lunch at 87/5 with Dhananjaya de Silva lasting just six balls after the break before he offered a weak shot to Jhye Richardson and sent an easy catch to Travis Head at mid-on. Young gun Kusal Mendis added a brisk 42 before being caught at cover and the tail soon folded. They have now lost a home series to England 3-0, then away to New Zealand 1-0 to go with their two defeats in Australia. Australia won the first Test in Brisbane by an innings and 40 runs and ended their summer on a high after losing an intense home series against top-ranked India. Their knocks put them in prime position for the Ashes tour to England - their next Test assignment later this year where champion seam bowlers Jimmy Anderson and Stuart Broad await.